MindFreedom has learned of the recent passing of human rights activist and longtime MindFreedom member Sue Clark-Wittenberg, of Ottawa, Canada. Psychiatrized for nearly two decades, a survivor of both forced electroshock and forced drugging, she went on to fight for the dignity and human rights of all people harmed by psychiatry’s violence. Sue was 60 years of age. Sue will be missed by the psychiatry survivor community, a community she served and participated in over many years. Sue leaves behind an example to all who seek to have their voice heard in the face of psychiatry’s enduring human rights abuses. Sue has truly left behind a ‘digital footprint’ for future generations to hear her testimony, and we honor the memory of her nonviolent activism in the face of psychiatry’s violence. We encourage you all to Google her name and see the many blogs and videos she left us to consider, as well the testimony and speeches she gave at universities and to Canadian legislators. 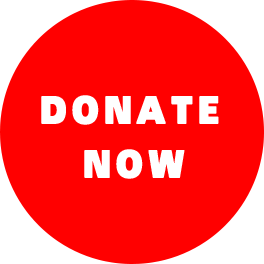 Below you can see Sue on Youtube, speaking out with immense dignity against the harm done to her and so many other innocent people by forced psychiatry. This video has had 100,000 views. Our thoughts are with her loving husband, Steven Wittenberg, who was also psychiatrized in his youth. So many millions of people have been so harmed, so betrayed by forced psychiatry, that they live out shortened lives in silence and never speak out. Sue was one of the brave ones who would not be silenced. Her meaningful life, over too soon, shows us all how the sharing of our experiences with the world, is a worthwhile and noble thing that the psychiatric survivor must do, if we are to ever convince society we deserve equal human rights and an end to the state-sanctioned violence against us. The day we all hope for, when the chorus of survivor voices grows too loud for society to continue ignoring, is brought a little closer by people like Sue. We thank you Sue. Sue’s friend, scholar and activist Bonnie Burstow, has written an extensive tribute to her here… this tribute is a must read.. I am antipsychiatry activist as well as a former psychiatric and electroshock survivor. I was psychiatrized from 1972-1990 in Ontario psychiatric hospitals for severe depression. I had been brutalized at home as child by both my parents and an uncle. At 17 years old I experienced a “spiritual breakdown” or a classic “nervous breakdown”. I became homeless as I ran away from my upper middle class home. I had never wanted anything material like food or clothes or a place to stay before. My dad had an executive job in the federal government and made good money. I was experiencing many symptoms of stress like not sleeping, being agitated, being fearful of my impending future as I had no money and nowhere to go. A high school chum of mine said I could stay at her house while her parents were away in Florida. It was March of 1972 and I was in grade 12 at Sir Wilfrid Laurier High school in Vanier, a suburb of Ottawa, Ontario. I missed lots of school and the high school psychologist suggested I go to the Royal Ottawa hospital (ROH), a psychiatric facility for a meeting in the Emergency ward to see about my “nerves”. Well I did go to the ROH and did not know anything at all about psychiatry. A doctor and a nurse were waiting for me and noticed my panic attacks and anxiety and that I was under considerable stress at the time. They both suggested I come into the hospital or a few days to rest and so I agreed – as I had nowhere to go and had no money and did not know about the community resources that may have been able to help me. So I was admitted to Whitney 4 ward which was a locked ward. I was given a physical and an interview by the ward psychiatrist. I had never been locked up before in my life and my freedom taken away from me. I told the psychiatrist I had been abused for 17 years of my life. They asked that both my parents come onto the ward to see my psychiatrist which they did. One night as the nurses were sitting in a office with the door closed, I managed to grab my file in a hurry and looked at it. My file said “parents denied ever abusing Suzanne (me) My psychiatrist concluded: diagnosis for me was:”schizophrenia”. Right then and there I was labeled on my medical file forever. A schizophrenic I was being called. I was confused when I read that and angry that my parents denied ever abusing me which is not uncommon for most abusers to do. I was given heavy doses of psychiatric drugs that kept me incoherent, had difficulty with my co-ordination, had a dry mouth, made me sleepy (I slept 20 hours a day only to get up for meals when awakened by a staff member) and I could not think straight at all. Psychiatry tried to dissect my soul and they did indeed. They took away any bit of self esteem I had, any ounce of dignity I had left in my life, and they made me afraid for my life as the staff scared me and told me I was sick and I had to take the meds to help me get better. I am an animated person and I am emotive. I told the staff what I thought of being tortured with their psychiatric drugs, chemical restraints (a needle put into my hip when I yelled at the top of my voice to someone to get me off the ward – no one ever helped me when they heard my cries). I was not violent. I was prisoner on a locked ward and I had done nothing wrong, I was an abused kid who was trying to get her freedom back. Psychiatry put a label on my head and gave me the drugs to go along with my so called mental disorder. When the meds did not work, I got another label to go with the new psych meds. In the 18 years I was psychiatrized I got 15 different psychiatric labels/disorders and 14 different types of psychiatric medications/pills. I was forced to have 5 electroshocks (ECT)against my will in 1973. On my 5th ECT my heart stopped and my ECTs were stopped. I tried to hang myself on the Whitney 4 ward and a nurse cut down the rope and saved my life. I could not handle being on that ward at all. I survived all of that and now know psychiatry is the biggest medical fraud out there today. I later became a speaker at the Royal Ottawa Hospital in their Consumer As Expert Program in the 90s in their education department and spoke on antipsychiatry issues. Believe it or not it is true! Label jars not people someone said, I don’t know who said this but it is one of my favorite quotes. All I needed at 17 years old was a foster home with a stable family who were caring and safe. My childhood home was not safe and there was no love. I had the best of clothes and food and went on vacations and grew up in a huge house but that is not what really mattered. I wanted someone to put their arms around me and tell me I was good kid, and feel special to someone but did not happen. Child abuse can emotionally cripple someone and for a time it did. My brother calls himself an “emotional cripple”. I feel through the cracks so to speak at 17 years old and I did. Psychiatry sitll continues to print their DSM book,the psychiatrists “bible” with more bogus mental illnesses, over 300 or more mental disorders everything from A to Z. bipolar, manic depression, schizophrenia, and the list goes on and on. The DSM V is being developed soon by the American Psychiatric Association. Consultants get $10,00 paid by pharmaceutical companies nevertheless. I am starting to reclaim who I am, what I want to do and where I want to go. Yes, I am different. I am not a fashionable person, do no wear makeup, I talk loudly, wear brightly colored clothes, am a neat freak, talk alot, say what is my mind and do not follow the crowd and never did. In high school I did not realize there was an ” in crowd”. A social worker wrote down on my file that I was “eccentric”. I told a friend what the file said and I was very upset and she told me “that is a compliment, it means you are an original person”. I am who I am and I like that now. Some people put me down but I shrug it off and I say well that is their problem not mine. I have tried to put back the fragmented parts of soul that psychiatry tried to destroy. Psychiatry tried to destroy my individualism, my creativity, my spiritual visions, and tried to destroy my core, my soul. They did not succeed. I was damaged by psychiatry but I am healing in my own way. I speak my truth and no one can take that away from me. I have my medical records and they tell the horrors of what I experienced in the mental health system. This mental health system has to be fixed because it can be toxic and it sure was for me. I don’t want anyone to go through the many tortures I went through on the psychiatric wards that still exist to this day. 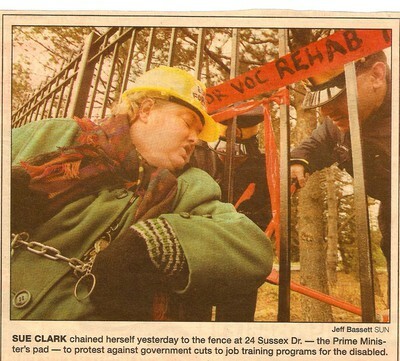 Sue Clark-Wittenberg, above, after she chained herself to the fence of the residence of the Prime Minister of Canada in protest. Canada’s contempt for the human rights of those its government name-calls as ‘mentally ill’ is well known. Without a doubt, Canada has one of the worst reputations for forced psychiatry in the developed world. Canada is a country where rampant ‘community treatment orders’ forcibly pump psychiatric drugs into the never-proven-diseased brains of citizens in their own homes. In Canada, extrajudicial forced drugging is carried out against tens of thousands of citizens each year. Sue was one of the growing number of Canadians speaking out. MindFreedom encourages any Canadians to become active in the psychiatric survivor movement in a country that sorely needs it. Canadians can contact MindFreedom for a list of local contacts in this regard. As Sue says in the one of her Youtube videos, “Help us!”. “I had been contemplating for years if I should forgive my many abusers. I had been angry for years and would not give up that anger that was eating away at me. It was my baggage of despair, of hopelessness, of shame. I decided within the last month to forgive all my abusers – my parents, my Uncle Lyman, my former husband Fred, and many others I shall not mention. I felt the anger and hate towards my abusers was eating at the very core of my soul. It affected my health greatly. I would overeat when I felt the feelings of anger and I ate to comfort myself into being comfortably numb. I also used psychiatric drugs that were toxic to numb me. I realized last month, hating my abusers was futile. It was wasting my precious energy everyday that I could be doing something useful and more meaningful. I prayed in my heart to let the anger and hate leave me and I saw a phoenix in my mind flying from out of the ashes, the ashes of emotional pain I hung on for years. I don’t want that emotional baggage weighing me down anymore. I want to live my live and be free of the anger. Anger is fear. I want to let know of the many layers of pain I have surrounding my body which is the layers of fat that insulated me from feeling any emotional pain. I don’t need to overeat and stuff down my emotions from the pain from the past. I have suffered enough. Today I got up and went on the internet and felt happier than I have been in my life. I felt lighter, not holding on to past anymore. I want to feel all my feelings without having to use food to numb them. Just because I forgave my abusers does not mean I have to associate with those people. I have cut them off years ago, but I had not forgiven them for many years. Anger is a waste of time for me especially when it was something that happened many years ago. Some of the abuse damaged me badly, but it is up to my heal, that is my job. I have done lots of healing in the past. I have had alternative therapists, feminist therapists, sexual abuse counsellors, social workers, regression therapist, and the list goes on. I like to draw and am not very good at it but I try. I want to art today and have fun. I laugh more and smile more than I ever have. When I laugh it is a deep belly laugh and I feel so much better. Laughter is the best medicine and it costs nothing. Forgiveness is a journey, it takes time to be able to forgive people who hurt you. Those people need to forgive themselves also. You can’t forget what happened to you. It stays with you all your life but you learn how to cope with all the trauma. Forgiving feels good, I feel free to be me and not have part of my soul imprisoned by anger and rage and animosity towards my abusers. I know my truth and my abusers know who they are. I believe that victims and abusers both need healing. 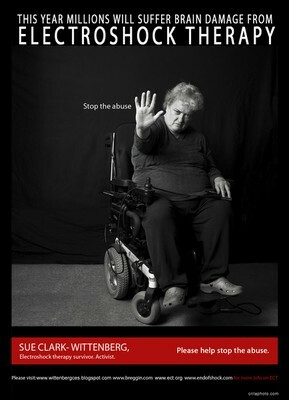 Abusers have often been hurt themselves and then they lash out at others. I am not saying what abusers do is ok, I am saying they were once victims themselves. Abusers need to look at themselves and take stock of their lives and see how they have hurt people and see how the long term effects of what they have done can have on their victims and their families and friends. I believe anyone can change if they want to and have the desire and realize what they have done is wrong. The criminal justice system needs to do more healing work with people inside our prison system. The present system does not work. Putting someone in a cage is inhumane. There needs to be preventive measures taken when problems arise in kids, not later on when they commit the crimes. Violence is not ok. We need to work to making our communities safer and by making our citizens feel secure. This can only be done if everyone in the communities work together for the greater good of all. Compassion for all goes a long way….I have come to this point in my life where I realize this. Like so many millions of human beings who have been forced into psychiatry’s so-called ‘care’, when their society betrayed them and decided their voices, their consent, their human rights didn’t mean a thing, Sue never did live to see the sun rise on a world where people no longer had to live in fear of unwanted meddling in their lives and bodies at the hands of psychiatry’s state-sanctioned violence. But her dignity, in never ceasing to tell her story, never ceasing to help others who came to her for help in finding their own freedom from psychiatry, is a hopeful sign that one day, the chorus of the voices of survivors, may grow loud enough that society finally comes to our rescue and stops inflicting on people, once and for all, the atrocity that is forced psychiatry. 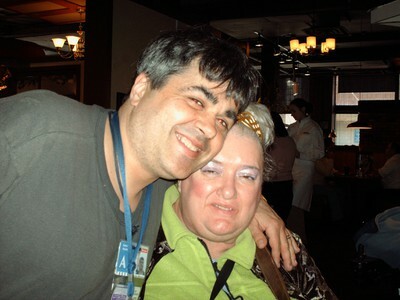 Sue and husband Steven Wittenberg pictured in 2007. Rest in peace, Sue Clark-Wittenberg. The world needs more people like you.